Another book I salvaged from my parents’ collection is Australia Felix, the first volume of Henry Handel Richardson’s trilogy, The Fortunes of Richard Mahony, in an edition published as a Penguin Modern Classic in 1971. My copy is a 1977 reprint. Obviously “HHR” finished it; I couldn’t. Part of my problem was that it is a story which, from the outset, one knows will not end well. I always have difficulty with these: King Lear, Otello. are two examples which spring to mind. Yet I am happy to go to operas, where, God knows, a tragic ending is often enough a given, so that cannot really be the problem. Another is that first-half-of-the-twentieth century realism is not, for me, a high point of literary history. Even the discovery of a new word within the first three lines – “uprights and tailors” – a word which I have been unable to find in a dictionary but which presumably refers to tailed timber cross-struts – was no consolation. As far as I got, it all seemed so dreary. Yet I suppose I could overcome that. Meanwhile, squatting over my reception of the work is a xxviii page introduction by Leonie Kramer. Kramer’s work on the sources of The Fortunes of Richard Mahony was, if truth be told, her only substantive academic work. The rest was energy and politics which are not congenial to me. To her protégées, and they were many, Kramer was an inspiration; to my crowd when I was a student in the English department at Sydney University she was an unloved and unwelcome reactionary. Just one of the counts against her was that she had complained when Dennis Altman was invited to speak about homosexuality to medical undergraduates at UNSW, including one of her children. I still cannot work out how a Professor of Australian Literature thought it right that she become a member of the board of Western Mining; let’s not get started on her role in the push for demutualization of the NRMA. Though she disdained feminism, she was a useful conservative female figurehead. Enough. The woman is dead now. I should try to get over her, but it may take a bit more time. I’ll hold on to my copy of Australia Felix a little longer in case the cloud lifts. This is the second in a series. Amongst the books I have salvaged from my late father’s house is a copy of George Johnston’s last book, A Cartload of Clay. My copy is ex the YMCA library in Sydney. 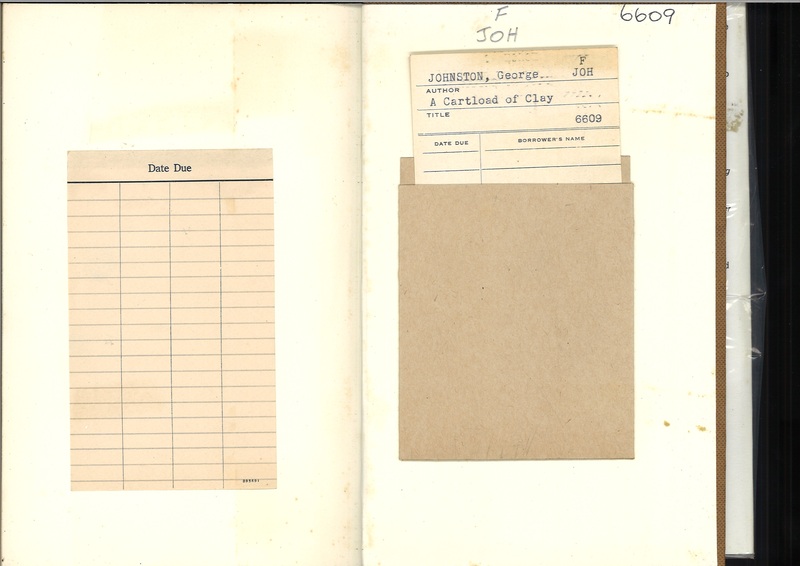 A pristine date due slip and loan card in an envelope pasted inside the back cover suggest it was never borrowed from that library. The front page bears the name of a colleague of my father’s, with whom he lunched practically every day when they were both at work (I joke that he was “the other man”). Judging from another, pencilled note “1st ed. $1” he bought it second-hand. Published in 1971, this the third instalment of Johnston’s “David Meredith” trilogy, following My Brother Jack (1964) and Clean Straw for Nothing (1969). I heard My Brother Jack read (abridged, obviously) as a serial on ABC Radio some time in the early 70s and later read it and Clean Straw for Nothing when I was about 16. I surely also read Cartload of Clay then, if only out of completism, though I have no real recollection of that. I was probably too young to get what it was on about. The trilogy is autobiographical – David Meredith is Johnston, subject to the usual fictive rearrangements. Cressida is his second wife, Charmian Clift. Johnston and Clift returned to Australia in 1964; Clift committed suicide on the eve of the launch of CSFN. Cartload follows a day when the widowed Meredith sets out on a “practice walk” up the street to the church where his daughter is to get married. Like Johnston, Meredith has lung problems. He doesn’t get far. Taking a breather at a bench by a bus stop he meets various local characters and dozes off and his mind wanders – to an interlude in wartime Kunming – an affair and his friendship there with the poet Wen Yiduo; – to a trek on the Tibetan plateau with a photographer friend who later fell off a mountain when stepping back to take a picture; to his time in Greece; to his return to Australia and his encounters with the younger generation; to the suicide by Cressida with the stock of barbiturates he had kept by his bed to do the deed for himself; to his childhood in Elsternwick – revisiting a subject already dealt with in My Brother Jack, but now treated with less scorn. It is hard to see how the novel could have finished other than with the death of David Meredith. In the end, Johnston beat his character to it and the book was published unfinished. There is a good introduction by Sydney’s Mr Literature of the day, John Douglas Pringle. I realise that I am pretty much exactly same age that Johnston must have been when he wrote this – he died just two days after his 58th birthday. I am sure this makes me more receptive to its themes than I can have been when 16. I’ll squib the duty of a literary critic just as I do of a musical one: I don’t profess to say what the book is about (as if a novel can be reduced to a syllogism). There are some quaintnesses of period (the Youth generation; women) but also much that is resonant to me – poetic even. I have enjoyed reading it. Here is an extract – omitted yesterday on account of ANZAC day. That is in chapter 14. There’s something a bit overbearing, like an old-style newsreel voice over, about the second person address in this chapter, but I love how the fingernails come back into it. One funny thing. Johnston’s final home was in Raglan Street, Mosman – thinly disguised in the novel as Inkerman Street, “Northleigh.” I cannot imagine that I knew this before I looked it up in a biography of Johnston also salvaged from my father’s house, but as I read the book I already had a distinct picture in my mind of a street in Mosman and the bus stop where Meredith pauses. It wasn’t the exact street, but it was pretty close. D is out of the country at present. D sometimes complains that days, even weeks when he is here can pass without any substantive conversation from me. Nevertheless, whilst he is away I find I have more time to read. Inspired by Daniil Trifonov’s performance of Schumann’s set of pieces Kreisleriana, I decided to track down their literary namesake – ETA Hoffmann’s literary alter-ego, Kapellmeister Kreisler. Hoffmann first adopted this character as a journalistic pseudonym in about 1809, but he reached his greatest fame through Hoffmann’s final work, Lebensansichten des Kater Murr – translated as The Life and Opinions of the Tomcat Murr together with a fragmentary Biography of Kapellmeister Johannes Kreisler on Random Sheets of Waste Paper . Yes, that is the Hoffmann of the Tales of Hoffmann, author of the story on which The Nutcracker is based, and famous in music history for an equivalent to Schumann’s “Hats off, gentlemen” welcoming of Chopin’s genius when, about 20 years earlier, he acclaimed Beethoven’s Instrumental Music (in a review of Beethoven’s Fifth Symphony) as the apotheosis of romanticism. It is popular sometimes to mock the insularity of Americans who know little of countries outside the USA, but it is no less shocking to contemplate the literary insularity of the Anglosphere when you realise how little presence there is in English of a writer such as Hoffmann. Most of what little the University of Sydney library has is confined to its stacks (as so much is these days) and a visit to Abbeys bookshop in town proved fruitless. I have read two of Hoffmann’s shorter stories in the original German. That was when my Deutsch was in better nick than it is now. Fortunately, Penguin Classics published a translation by Anthea Bell of Kater Murr usw in about 1997. It was obviously a labour of love on her part. I doubt if it has been a great commercial success for them. Gratifyingly I was able to track down a copy in the City of Sydney Library. It is marvellously easy to order a book to be delivered to the branch of your choice. Public libraries are wonderful things. The conceit is that Murr, a tomcat of literary pretensions (he has surreptitiously learnt to read and write by carefully observing his original master, Abraham) has written his autobiography. By the time of writing this, he is living with Kappellmeister Kreisler. He has adopted and treated as scrap paper an account of Kreisler’s life (in fact, more like a gothick novel featuring Kreisler) and left pages of it as if used as blotting paper amongst those of his manuscript. Accidentally, according to Hoffmann (describing himself as the editor) the printer has printed everything, with the result that sections of Murr’s narrative are interspersed with sections of the story of Kreisler. Murr’s account is continuous, subject to these interruptions – that is, with one exception each extract takes up from where the last left off; the extracts of the Kreisler story are discontinuous and in some disarray – Murr, the “editor” tells us, seems to have torn up some of the paper or used it for something else. On occasion, Murr mixes with dogs. In this fictive world, dogs are cats’ social betters. Murr lives in fear of them even when they befriend him. Following the restoration of the status ante quo at the Congress of Vienna, there was a crackdown against the student movements which had arisen and been while tolerated for so long as useful in the struggle against Napoleonic France. Hoffmann, by then holding a day-job as a judge in Berlin, was involved in investigating these nationalist student fraternities with which he likely sympathised. Murr joins a cat-fraternity until it is broken up and his friend killed from a dog-bite. Some political satire appears intended, albeit obscure to me. The plot of the Kreisler story revolves around a princely household in a former microstate which has been swallowed up by neighbouring states (probably a reference to the consolidations imposed by Napoleon). Whilst appearances of a court are maintained, it is all pretence with which the prince’s erstwhile subjects go along. The prince himself is satirized as a ridiculous figure much given to French phrases and punctilious in his observance of now meaningless aristocratic niceties. To this “court” comes Kreisler after quitting a Grand-ducal Court where his art was not respected, true German art being overshadowed by Italianizing fashions – Rossini is amongst the resented. Hoffmann himself wrote an opera, Undine, favourably noticed by Weber, and spend some years in the theatre at Bamberg after he lost his legal job in the Prussian part of Poland as a consequence a Beethovenesque (cf Eroica) lack of respect towards the occupying French. One Prince Hector, proposed suitor of the ex-micro-Prince’s daughter, Princess Hedwiga, has designs on Julia, daughter of Madam Benzon, widow of a councillor at the little court and mother also of a mysteriously disappeared illegitimate daughter of the micro-Prince. Kreisler loves Julia with echoes of the impossible artist’s love (OK, he is an “impossible artist” but I probably mean “artist’s impossible love”) which is the theme of Offenbach’s operatic adaptation of other Hoffmann tales. Kreisler confronts Hector with a painting given to Kreisler by Master Abraham, Kreisler’s mentor and (if you can recall that far back) Murr’s master. Set upon by a retainer of Prince Hector, Kreisler kills his assailant and flees to a monastery. There is plenty of critical writing, much of which I have dipped into on the internet since reading the book, about the comparison between the self-satisfied Murr and the restless, mercurial Kreisler. Whilst the general trend of this is to prefer the Kreisler narrative, even Murr encounters some of the difficulties and humiliations of an artist amongst society. Gradually we learn that something terrible happened in Naples involving the Prince Hector, his brother, and Master Abraham, of which the painting was a reminder. The missing illegitimate daughter was murdered, and then there is the question of what has become of Abraham’s wife, whose psychic powers were an essential element of Abraham’s “Invisible Girl” trick. She is supposed by him to be missing possibly dead; we we know she was abducted and imprisoned at the instigation of Madam Benzon by arrangement with the petit-Prince for fear she would expose their liaison and maybe she is the Papagena-like crone in Naples. Master Abraham goes on the road and entrusts Murr to the care of Kreisler. Presumably this is when Murr uses the Kreisler “waste paper” to write his life history and thoughts. At the end of book 4, which is the end of the second published volume, Hoffmann as editor sorrowfully announces that Murr has died. Some fragments by Murr survive, which Hoffmann hopes it may be possible to publish with the remainder of the Kreisler story in a volume 3. Hoffmann himself died shortly after. So no volume 3, which is pretty maddening. All those dark gothic secrets unresolved on the Kreisler side! I can accept the Murr material stopping so abruptly because suspense is not an element in that. I haven’t really captured here the humour of the book and its charm: cats in novels are almost as good as on the internet. Hoffmann, who is said to have had an actual cat, Murr, must have been a cat lover. This endears him to me. You are currently browsing the archives for the Unfinished books category.